Many times even you aren't using your car and stays in the garage for a year or two it accumulates dirt and the headlight lens oxidize.Making it impossible to drive at night thus giving up a little recipe for disaster since you have atleast 50% of the correct light intensity that should pass thru it. How would you like to resolve such problem? 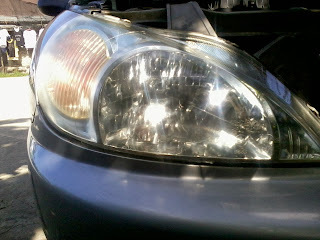 Headlight cleaning is a tedious task. You need a buffing machine in order to have an even finish and make it more presentable. I watch alot of Do-It-Yourself clips over Youtube. 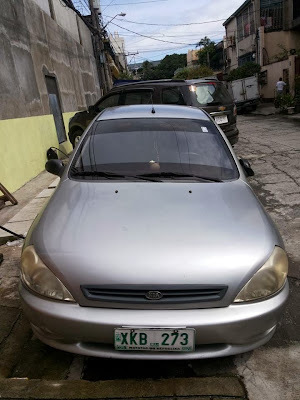 Ask some friends who are into Car Detailings, Research on Forums and read blogs. Some of them actually suggest using Meguiars and Mothers as good product. Others using Turle Wax Product and the cheapest are the car detailers who uses Toothpaste. It seems to me that they see their headlights as Teeth and not as headlights upon using toothpaste. Well each and everyone have freedom to do what they wanted to use. For the best Result, I would recommend reading along each instructions I will post here in order to have a mirror finish. Giving you an output of a brand new lens will really make you smile better and feel good. Bragging with your co Car Enthusiast that you've done such good job. Let me show you the Before and After photos of my Project Headlight. And this is how He looks like when the owner posted on her Facebook page. A closer look for you to imagine how foggy it was. Another shot for the Passenger side headlights. after 30 minutes this is how it looks like now. Lights from the sun rays are able to reflect on the chrome background of the headlight assembly. Isn't it so nice to see? I already clean this side of the headlight and I have to try again in order to have a mirror finish. Here's the step by step procedure. 1. Using a soap or a dishwashing liquid clean the assembly. 2. With water and soap inside a tub use a 240 grit of sandpaper. 3. Rub with circular motion. You will notice that the water will turn yellow. This is the dirt outside the headlight. We are actually scraping it all. 4. 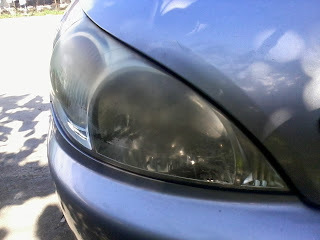 Once you notice that they are no more yellow particles on your headlight its time to change the Grit of your sandpaper. 5. To make it clear again, we will start will the 1000grit of sandpaper. Rubbing it again in circular motion together with water + soap. 6. Using it again a 1200 grit then 2000 grit until you feel that the surface of the headlight are smooth as silk. 7. Tumble dry the surface. Leave it for 10-15 minutes. 8. Now for a more clearer output we will move to the compounds. I'm using a Turtle Wax Polishing Compound. It's available at Ace Hardware for 50 pesos per pack. Rub the compound overall the lens. 9. Clean and dry the compound. 10. Using a 3M Swirl Mark Remover applies it on the lens. Rubbing it again using a circular motion. 11. Using a 3M Polishing compound clean the lens. Rubbing it again using a circular motion. 12.Using a Glo Metal Polish. This is the compound you use to clean brass instruments like trumpets and cymbals. Rubbing it using a circular motion. Apply pressure will help a lot. 13. For best result, apply a Turtle Wax for a mirror look finish. I've worked for this for 30 minutes. 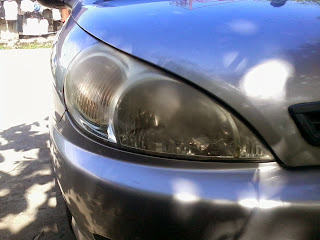 It would cost me Php500.00/pair to have it restored. All the compounds can be both at DO-IT-YOURSELF shop. Some are already packing in small amount. Thanks for reading. 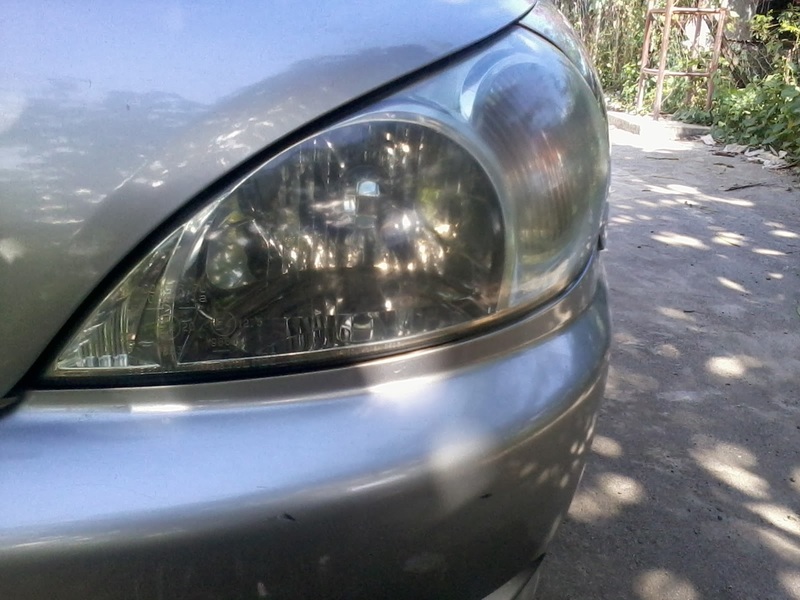 I hope I have help you on achieving a clear, mirror finish Headlight lens.